Organic, gluten free, kosher, no refined sugars, soy and dairy free. Not made in a gluten free facility. 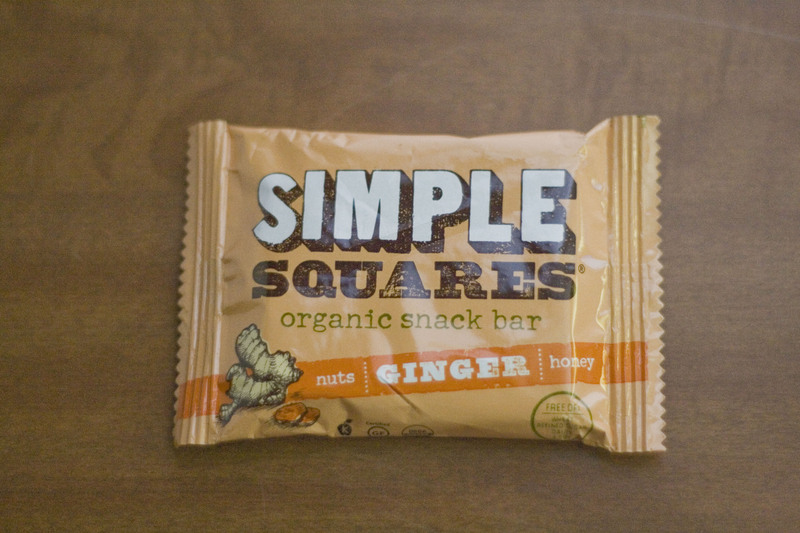 It’s been a couple weeks since I last reviewed a Simple Square so it is time for another go, this time with the ginger flavor. The ginger one is just like the coconut Simple Square, but with added ginger which, as a fan of ginger, I thought I would like but I actually found it kind of off-putting. I love the Simple Square for it’s simplicity, even though this one is slightly less simple with seven ingredients. The flavor wasn’t bad, it wasn’t good, it was best described as mediocre. Maybe I had my standards set too high after the coconut Simple Square, but this one was a real let down, especially compared to the Squarebar. I would say the major selling point here is that it is kosher, which I imagine is a huge win for people who keep a kosher diet but I don’t so it’s not relevant to me. Just like the last Simple Square reviewed, this one has nothing to get melted in high heat situations, which makes it great for Burning Man. Personally, I would still opt for the coconut one over this ginger one.